NESCA News & Notes: Children and Nature: Who Let the Kids Out? Are your children spending too much time inside? Learn the high cost of nature deficit disorder - and how easily you can avoid it by getting your kids outdoors. You’ve probably had this experience: The kids have been cooped up all morning and now you're heading out to the park, just to get them outside. In the car, they squabble and sulk — the oldest doesn't want to go, the second complains about the third's singing, the third begins to cry — and you’re on the verge of losing it. No one, you're convinced, will make it back from this outing alive. But when the kids pile out of the car, everything changes. They begin running around, exploring, getting dirty, discovering rocks, and making up games. When it's time to pack up, everyone is cold, muddy, and hungry but miraculously transformed. What happened, exactly? Call it the restorative power of nature. Many parents observe these positive effects every day. Since Florida mother and writer Dianne Venetta created an organic garden in her back yard, it's been a major draw for both of her children — though in different ways. "My son gets down in the dirt and finds bugs and bees and worms, and [he] wants to learn everything about them," she says. "My daughter is more of an observer — she likes to photograph and draw everything she sees." Heather Reed, who lives in Texas, says her son Timmy begs to go outside every day, and has since he was very small. Timmy, now five, has autism and developmental delays; he doesn't speak. When he wants to go outside, he grabs her hand and leads her to the door. "He loves watching the water in the pool ripple and the shadows that are created from sunlight falling on objects," Reed says. "He doesn't need a reason to be outside; he just wants to be there." After he's spent time outdoors, Timmy is more relaxed and tends to interact more, she says. A growing body of research supports anecdotal evidence of nature's therapeutic effects — on children, adults, and communities as a whole. Scientists at the University of Illinois' Landscape and Human Health Laboratory, for example, found that time out of doors reduces symptoms in children with ADHD. They also demonstrated a link between exposure to nature and increased self-discipline in girls, and a third study found that vegetation reduces crime in urban communities. Research by University of Rochester scientists even found evidence that nature makes people more caring. But despite the evidence, many children today have little contact with the natural world. 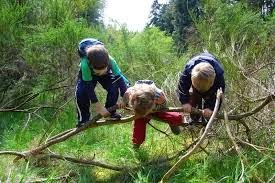 In his groundbreaking 2005 book, Last Child in the Woods: Saving Our Children from Nature-Deficit Disorder, Richard Louv explored the fundamental role nature plays in stimulating kids' imaginations and creativity, promoting health, and building resistance to stress and depression. In Last Child in the Woods, Louv coined the term "nature deficit disorder," which he defined as "the human costs of alienation from nature, among them: diminished use of the senses, attention difficulties, and higher rates of physical and emotional illnesses." Louv is quick to point out that nature deficit disorder is not a medical or psychological diagnosis, but a name he's given to what he sees as an increasingly widespread social condition. He believes this condition plays a role in rising rates of childhood obesity, Attention Deficit Disorder (ADD), Attention Deficit Hyperactivity Disorder (ADHD), depression, and other physical and developmental issues. Louv points out that children today spend far more time indoors than their parents did. (According to the Children and Nature Network, a national nonprofit co-founded by Louv, only six percent of children ages nine to 13 play outside on their own in a typical week.) Increased urbanization, overscheduled calendars, parental fears about crime and other hazards, and the lure of electronic media have driven kids indoors and away from the natural world. "For a new generation," he writes, "nature is more abstraction than reality. Increasingly, nature is something to watch, to consume, to wear — to ignore." Recent findings by the Henry J. Kaiser Family Foundation support Louv's bleak portrait of young lives spent indoors — and plugged in. Kaiser researchers found that American children ages eight to 18 spend an average of seven hours and 38 minutes a day using "entertainment media," including TVs, movies, computers, video games, cell phones, and MP3 players. The amount of time kids spent on electronic media had increased by an hour from the previous study in 2004 — and researchers didn't even include the amount of time kids spend texting in these calculations. Kyle Morrison, an exercise physiologist who works with obese children and teens at the Healthy Weight Center at Helen DeVos Children's Hospital in Grand Rapids, Michigan, sees the effects of nature deficit disorder in his practice every day. "A lot of the kids I see are completely out of touch with nature," he says. "Many of these kids live in areas with gang activity and other types of urban violence. Their parents are working all the time and they don't want the kids going out, even to the local park, because they think it's too dangerous. Families can't afford to go on vacation or pay for summer camp, so these kids are staying home all day, sitting in front of the TV or playing video games." The result is teenagers with obesity and related health problems, including prediabetes symptoms and sleep apnea. Many also have asthma, a condition that Morrison believes is exacerbated by lack of exercise and lack of exposure to allergens they would routinely encounter if they spent more times outside. He estimates that 30 to 40 percent of the kids he sees suffer from depression and/or other anxiety disorders as well. Louv’s thesis clearly struck a chord — Last Child in the Woods became a national best seller, received awards, and was translated into ten languages — and has helped inform a growing movement of parents and educators who want to combat nature deficit disorder. Doctor's Orders — Kyle Morrison works with his patients on lifestyle changes like increasing exercise and improving eating habits; he also beats the bushes to find scholarships for summer camps, in hopes that a few of his patients will have the opportunity to spend a week of summer outdoors. Beyond the human toll of nature deficit disorder, health professionals like Morrison are concerned about the financial costs of treating people for conditions like obesity, diabetes, asthma, and depression. A growing number of physicians are treating nature deficit disorder the way they treat other maladies: by prescribing time-out-of-doors for patients — adults and kids alike. Green Hour — Many national environmental groups have started campaigns to encourage kids and families to spend more time outside. The National Wildlife Federation, for example, recommends that kids spend at least an hour a day out of the house, which they call the "Green Hour." The Sierra Club's Building Bridges to the Outdoors program is a nationwide effort to give every child an outdoor experience. And the Outdoor Alliance for Kids (OAK), recently kicked off a Facebook campaign called Get Your Nature On to inspire kids to spend more time outside. Wilderness School — Bay Area Wilderness Training (BAWT) provides wilderness training for teachers and youth leaders; it also has a lending "library" where groups and teachers can borrow outdoor equipment, including backpacks and tents, for free. Teachers and youth leaders from all over the Bay Area and as far away as Fresno and Los Angeles come to BAWT for training and to borrow gear. Since founding BAWT eleven years ago, executive director Kyle MacDonald says he’s seen an increase in the number of schools committed to getting kids into the wilderness. Macdonald started BAWT specifically for inner city kids because, as a youth leader and wilderness guide, he’d seen the powerful effect that nature could have. "It's really profound," Macdonald says. "You see kids' faces open up, their backs straighten. You see it in their interactions with each other: the mild bullying, the frustrated nitpicky behavior — all that goes away when they connect with something larger than themselves." For Macdonald, it's about the future — not just for young people but for the entire planet. "If we raise a generation of kids whose activities are all indoors, they'll never develop a relationship with the environment — they'll see no reason to care. Connecting kids to the out of doors in a way that makes them realize, 'this is fun, this is a place I want to be' — that's going to create a generation of environmental stewards." October 2 (Thursday) 1:00pm Eastern: "Between the Synapse" internet radio broadcast on educating students with emotional or behavioral challenges, featuring special guests Jessica Minahan, M.Ed., BCBA, director of behavioral services at NESCA, and Jennifer Laszlo Mizrahi. Free app required to listen. Details HERE.